One of the best ways to experience the Wild and Scenic Rivers of the Wild Rivers Coast is by jet boat. Fun, exciting (but quite comfortable and safe), you’ll experience zipping through the cool water on a toasty summer day with family or friends, and viewing incredible scenery and iconic wildlife. You’re likely to see bear, deer and elk on shore, and eagles, hawks and ospreys soaring overhead or perching in trees by the river. You’ll also learn about the history and culture of the Native people who have lived there. The weather on the Wild Rivers Coast is variable, and mornings and evenings tend to be cool. It’s a good idea to dress in layers when taking a jet boat tour. Also, be sure to wear a hat and sunglasses. Jerry’s Rogue Jets, out of Gold Beach, was founded in 1958 and was the first commercial jet boat tour company in the United States. Two of its most popular tours are the 64-mi. round trip between Gold Beach and Agness, and the 104-mi. round trip that includes an additional rocky, narrow, 20-mi. stretch of the Rogue River with whitewater rapids. Where: Jerry’s Rogue Jets is located a short distance from the mouth of the Rogue River in Gold Beach, OR. Another jet boat company offering tours along the Rogue River is Rogue Jet Boat Adventures. Putting in at Touvelle Park near Central Point, they cover a 30-mi. stretch of the river that features Upper and Lower Table Rocks. Their boats are smaller and more maneuverable than most jet boats, providing not only more intimacy, but allowing pulse-pounding 360s as well. Where: Check in next door to Rogue Creamery on Hwy 99 in Central Point, OR. A quick shuttle will take you to their boat loading area at Touvelle State Park. 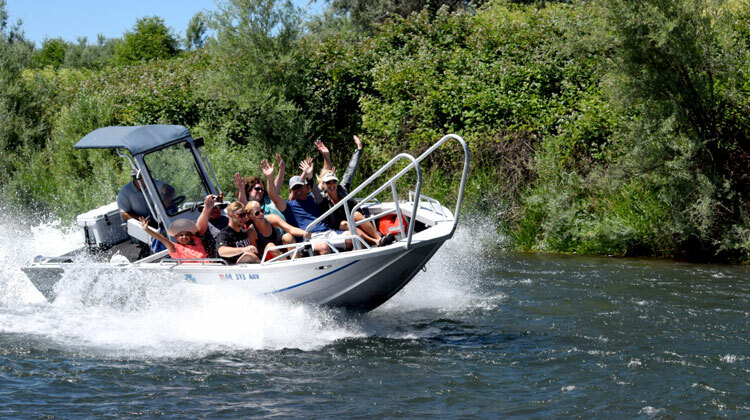 In Northern California, Klamath River Jet Boat Tours will take you on a 45-mi. round trip on the second largest river in California (by volume of water). The Klamath is a beautiful, pristine river that flows into the Pacific Ocean in southern Del Norte County. You’ll travel in comfort on a shallow-draft boat powered by twin jets, and have plenty of chances to photograph the spectacular scenery and wildlife. See more on page 13.